If you’re traveling for the holiday – or just have some extra time to relax — I’ve picked out a few Thanksgiving-related ebooks. 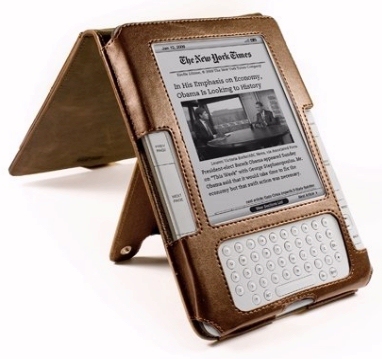 With all the excitement around the upcoming holidays, I’m already feeling grateful… that I’ll finally get some time to read on my Kindle! Here’s some of the best Thanksgiving ebooks — in different categories — that I found in Amazon’s Kindle Store. special audio version is now being distributed as a holiday CD! Perdue Farms sells over $4.6 billion worth of poultry every year, and for eight years, Rick Rodgers was their media spokesman. He traveled the country giving classes, according to Amazon’s description of the book, and delivers “everything, absolutely everything, you would want to know about buying, thawing, prepping, and roasting a turkey. awarded it four. It’s a classic — Amazon’s first review of the book was written in 1998 — but even today, it’s become one of Amazon’s best-selling holiday cooking books. Who better to tell the story of Thanksgiving than the pilgrims who lived through it? (My favorite chapter was the one about the very non-Puritan antics of Thomas Morton…) William Bradford began writing his history of America’s most famous pilgrims back in 1630 (according to my anthology of American literature), and he continued chronicling their life up to 1647. But the invaluable manuscript was never published in his lifetime, and after Bradford’s death, his family passed it down through the generations. The precious unpublished memoir traveled its own complicated journey, down through Boston’s Old South Church, and eventually even back to England. Finally it was published in 1856 — a full 200 years after it was written. And now today, thanks to the Kindle, we can take peek into the lives of the very pilgrims who first started celebrating Thanksgiving. 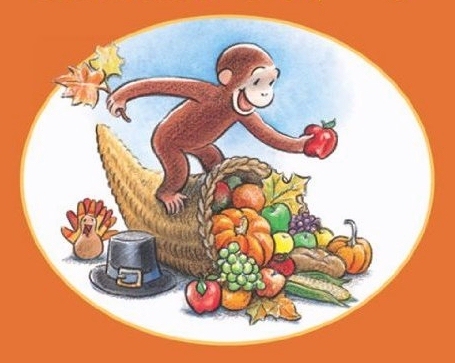 Just 12 weeks ago, a new Curious George book appeared, and this one has a special surprise. Yes, you may have read other children’s books about the playful and accident-prone monkey… But this one rhymes! George wakes up in the morning. A piece, a smidge, a slice. A turkey in the pan. The turkey’s in the oven. It takes some time to cook. George can’t help but take a look…. Uh-oh, I bet there’s going to be trouble. Hope you have a happy Thanksgiving!